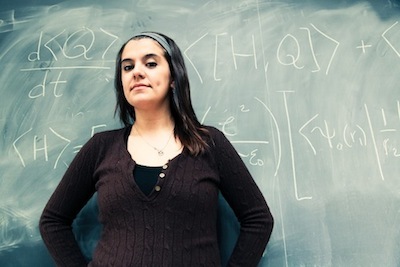 Senior physics major Melinda Soares has won honors for her research presentations at two conferences in the past year. "Classes are helpful, but I learn so much more from working on research projects," says Melinda Soares, a senior physics major at UC Santa Cruz who has won honors for her research presentations at two conferences in the past year. Soares has been working with theoretical astrophysicist Enrico Ramirez-Ruiz on a study of the remnants of exploding stars. She has also done research with physicist David Williams, using data from the Fermi Gamma-ray Space Telescope and the VERITAS telescope array to study high-energy gamma-ray emissions. "I've been fortunate to be able to do both theoretical and experimental projects," Soares said. "When you become immersed in the research community, you learn things you would never pick up in a class, just from getting to know the scientists, talking over coffee, and managing a project. The day-to-day work is quite different from one project to another, so I appreciate the opportunity to experience several projects first-hand." The first in her family to go to college, Soares grew up on a dairy farm in Gilroy. She started at Gavilan College in Gilroy, where she excelled, before transferring to UC Santa Cruz. Malika Bell, director of STEM Diversity Programs at UCSC, encouraged Soares to pursue undergraduate research opportunities. "She was confident that I was ready to begin a research project at a point in my education when I still felt rather intimidated," Soares said. Ramirez-Ruiz, an associate professor of astronomy and astrophysics, said Soares is an excellent student who has successfully managed the competing demands of coursework, research, and family life. A single mother when she started at UCSC, she now has two children, ages six and one, and a partner who works in San Francisco. Ramirez-Ruiz said her story is inspiring. "Despite all her other competing demands, her dedication to science and the quality of her work are largely unmatched by even the most dedicated and brightest physics students at UCSC." Soares credits her family and the supportive environment at UC Santa Cruz. "Being a parent has never been an issue at UCSC. The environment here is inclusive, welcoming, and encouraging. From day one I felt that people wanted to work with me and were willing to teach me the skills necessary to move the project forward," she said. Soares won first place honors for an oral presentation of her work on supernova remnants at the 2012 Emerging Researchers National Conference, held in Atlanta in February and hosted by the American Association for the Advancement of Science (AAAS) and the National Science Foundation (NSF). This project involved looking at the morphology of supernova remnants, the debris left over from an exploding star, and using features of the remnant to determine what the original star's properties were and what type of explosion took place. At an American Physical Society (APS) meeting in November, Soares earned second place honors for the Steven Chu Award for Best Research by an Undergraduate. At that conference, she presented her research with Williams on a class of supermassive black holes called blazars, which are among the most energetic objects in the universe. While Ramirez-Ruiz and Williams both provided valuable guidance on these research projects, Soares has also worked closely with graduate students and post-doctoral researchers. Amy Furniss, a physics graduate student in the Williams lab, worked with her on the VERITAS study of high-energy gamma-ray emissions. On the supernova remnant project, she worked with Laura Lopez, who earned her Ph.D. in astrophysics working with Ramirez-Ruiz and is now an Einstein Fellow at MIT. "Both of them have been great mentors. Without their help I couldn't have accomplished as much," Soares said. She is now starting a new project with Ramirez-Ruiz and graduate student Jill Naiman, using computer simulations to investigate globular clusters, spherical concentrations of stars tightly bound by gravity. Soares said she plans to continue working on this project after she graduates in June, and she will be applying to graduate schools in the fall. Michael Dine, professor of physics and chair of the department, said students who graduate with research experience are better prepared not only for graduate school but for working in the private sector and for facing real-world challenges in general. "It's a maturing experience for them, and they come out with valuable skills," he said. "For any student who wants to do research, the opportunities are available. We have a lot of undergraduates who are not only doing research, but publishing their research and presenting it at conferences." For Soares, the insights she's gained from her research experience include discovering what she likes to do and realizing that she is already a scientist herself. "I'm fascinated by science," she said. "There are so many intriguing projects I could see myself doing."